Bitcoin isn’t the future of money. It’s a piece of technology that takes us back to the future, because the future of money is more like the past of money than it is like the current, transient, version of money that is a historical blip, not a law of nature. Let me know about this treatment for a book chapter that I am writing. The nice people at Mendeley asked if I could pop in and give a talk about Bitcoin round about the same time as I was asked to contribute a chapter to a new book about cryptocurrencies. So I thought I’d put the two things together and use the talk [which you can see here] as a treatment for the book chapter. As the title of the talk suggests, David actually goes back to the past in order to understand the future of money, and what it holds in store for all of us as transactions technology advances. I’m genuinely interested in getting your feedback as I have to sit down and work on the chapter shortly. I’m going to call it “Back to the Future of Money — Bitcoin as Flux Capacitor”. Here goes. 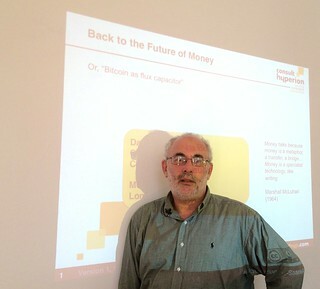 Benjamin Cohen from University of California, Santa Barbara, wrote a good book about the future of money, called The Future of Money, in which he sets out some of key issues around the topic. One of them is whether there is tendency to one currency in the future (something along the lines of the galactic credit familiar to science fiction fans) because the minimisation of transaction costs is the dominant, driving factor or whether an explosion of currencies is likely because new technology minimises transaction costs in other ways? Cohen concludes that “the power of scale economies notwithstanding, monetary geography is set to become more, not less, complex” and he compares the future landscape to the “heterogenous, multiform mosaic that existed prior to the era of territorial money”. To see two experts from diverse fields come to similar conclusions, that we need to look to the past not the present to see the future, especially since this is the same conclusion that I came to from staring through my techno-deterministic crystal ball, leads me to conclude that we are heading into an era of monetary experimentation, fragmentation and innovation. As a technologist, I suspect that there will be more different kinds of money, not just more currencies, than ever before. In the chapter I will look at what these kinds of money might be and how cryptocurrencies might evolve to actually remove money from some kinds of transactions. I predict that at the end of the transition to cryprocurrency, the marginal cost of introducing another kind of money will be approximately zero. So we will be in the “let a thousand flowers bloom” mode and might reasonably expect a rush to evolutionary dead-ends followed by mass extinction. If this analysis is anything like correct then it tells us that Bitcoin is not the future of money. Instead we should think of Bitcoin as the flux capacitor of “Back to the Future” fame. It is the key piece of technology that allows us to begin assembling a future economy that in many of its dynamics takes us to a richer and more diverse version of the past rather than a simplified version of the present. Suspect you are right but it a lot depends on the community the currency serves. How big is it? How many merchants will accept payment using a specific currency. Currencies competing against one another is nothing new, but what will these currencies be able to purchase? I guess that will depend on the financial services ecosystem that evolves around the currency so that stuff can be bought by the people holding it. As a result, some currencies will be pretty much worthless – why hold it if you can’t spend it? Reputation currencies which quantify your status in the community will enable resources to be allocated according to contribution. Keep an eye on communities that value values – they’re the ones developing currencies that will knock the others into a cocked hat. The point then moves away from supply side dynamics (which is what the banking world is fixated on) to demand side dynamics, which we are now finally seeing in the altCoin explosion. A sense of the answer is found in the altcoins. Either you think they are succeeding, so demand is shown, or you think they are failing, so demand isn’t high enough to rise above the costs. For my money, I’m on the latter. But that’s because I’ve also experimented with other places and times, and the altcoin phenomena has only really begun to hint at the possibilities. My money’s on explosion. BTW, a lot of this question goes away if you stop using the word “currency”. Instead, talk about financial instruments. Then, things we call money are just a subset, and the demand for alternate instruments is easily shown, check your local stock market or OTC derivatives menu.